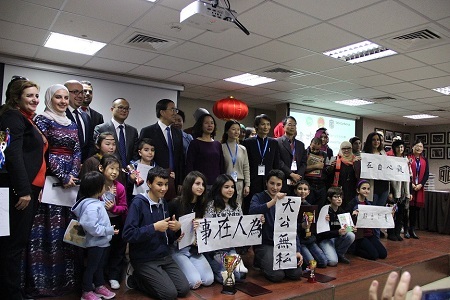 AMMAN - Talal Abu-Ghazaleh - Confucius Institute (TAG Confucius) organized a nation-wide Chinese Calligraphy Competition, attended by the Chinese Ambassador to Jordan, Mr. Pan Wei fang and the Cultural Advisor at the Chinese Embassy. The Chinese Ambassador expressed appreciation for the Institute’s achievements in teaching the Chinese language and advocacy for China-Jordan cultural exchange indicating that the organization of such a competition serves as a driver for learning the Chinese language. The Competition witnessed the participation of 52 competitors from TAG-Confucius, University of Jordan, Philadelphia University, Al Yarmouk University, and Islamic Educational College. Categories for the competition included adults and children and was composed of two sections; writing skills for children, writing skills for adults and writing skills using pen and writing skills using the brush. The top three positions for Brush skills were won by adults from TAG-Confucius Institute and the top three positions for Pen and Brush skills were won by children. First and second place winners were awarded with value rewards, while the remaining competitors received honorary prizes. Established in September 2008, TAG-Confucius Institute aims at introducing the Chinese language and culture and establishing further mutual understanding between Chinese-Arab cultures. This unique initiative is based on the cooperation agreement between TAG-Org and Confucius Institute, China.